The ratings of MBC Wednesday and Thursday drama series The Moon that Embraces the Sun almost hit 30% because of the debut of adult actors. 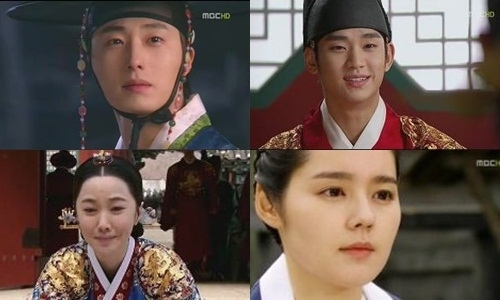 According to data of AGB Nielson Media Research company, the episode 6 of The Moon that Embraces the Sun broadcast on January 19th, 2012 rated 29.3% for national average ratings. The rating is higher by 4.4% from the 24.9% achieved on January 18th, 2012. The Moon that Embraces the Sun has achieved a new higher ratings record on every new episode broadcast since its premiere episode which rated 18.0%, and getting a rating that is close to 30% currently with just 6 episodes aired. If only Seoul metropolitan area is counted, the rating is 32.9%, which has gone beyond 30% mark. The analyzing for the substantial rise in the ratings of The Moon that Embraces the Sun can be contributed to the overly strong sense of anticipation to the replacement of young actors by the adult actors. Kim Soo-hyun, Jung Il-woo and other have successfully take over the relay baton from the hands of young actors, the king with leadership style and Prince Yang Myung who forbears his pain in the heart have been praised by audience. In addition, SBS’s Take Care of Us, Captain and KBS2′ Wild Romance broadcast at the same time achieved the ratings of 9.4% and 6.4% respectively.